In preparation for the European Referendum on June 23rd, 11,000 poll workers will have received online training and be better prepared to manage the referendum process, registration data and queries. The leading edge technology from Scytl delivered by Halarose Limited provides more intuitive and efficient online training and is setting the precedent for elections to come. In preparation for the European Referendum on June 23rd, over 11,000 poll workers will have received online training and be better prepared to manage the referendum process, polling stations and elector queries, according to Scytl, the global leader in secure election management and online voting solutions. Using leading edge technology from Scytl and delivery by Halarose Limited, online training is setting the precedent for elections to come. Recruiting and training election staff is one of the most significant challenges faced by election offices. During national elections, the UK’s 425 local authorities are required to train up to 73,000, geographically dispersed workers to administer polling stations and enable votes to be cast easily and efficiently. Each poll worker must be trained in order to successfully complete their specific duties on Election Day. Traditionally this training takes the form of trainers travelling to various sites and the production of costly training materials. Scytl Election Training delivers an engaging and interactive learning platform allowing workers to access comprehensive and engaging training content online. Scytl’s web-based technology enables election offices to train staff more effectively and cut costs, an efficiency that is already being realized by the poll workers being trained for the upcoming EU Referendum. 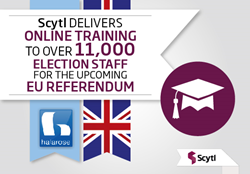 As electoral bodies across the globe realize the benefits of training poll workers online, Scytl continues to deliver leading edge web-based training and has trained over 62,000 polling station staff in the UK alone since 2012 and 500,000 election staff worldwide. Scytl’s Election Training accommodates a wide variety of learning preferences and styles through use of multimedia including video, voiceover and interactive exercises. By providing standardised training contents in line with the Electoral Commission’s guidance, election authorities can ensure they are receiving materials which are consistent and available at any time and from any location with an internet connection.